Every week we pull together some great Canadian recipes from Canadian food bloggers around the web featuring one main ingredient or dish. This week, we're getting warm and cozy with homemade soup recipes! When you live in a country that really and truly experiences winter every year you need soup. Soup for lunch, soup for dinner, soup to warm up, soup to feel full. And have we got soup for you - over 50 homemade soup recipes from all across Canada in this collection. Soup can be a rustic, hearty budget friendly meal or it can be a delicate mouthful of flavours. It can comfort you when you're sick and warm you up on the coldest days. Homemade soup can also be a meal saver when you have no idea what to cook - all you need is a big pot and some homemade or store bought stock and you can toss in some aromatics (onions, celery, carrots, ginger, a bay leaf or two). Add in whatever odds and ends you have in the fridge. It's a great way to help prevent food waste when you can use up all those veggie bits and even some old bread for croutons. Throw in some lentils or rice or pasta to make it even heartier and you've got dinner. If you want more ideas on how to make soup from scratch at home when you don't have a recipe, check out this great article from FBC Member Shifting Roots. She's got lots of tips that will help you out. But if a recipe is more your style then don't worry because we've got 50 homemade soup recipes right here for you. Some take 10 minutes others need a little more time. There's everything from classics like Chicken Noodle Soup, Butternut Squash Soup and Split Pea Soup. And then there's some cultural specialties like Polish White Borscht, Moroccan Carrot Soup, Filipino Chicken Sopas, Pho, Chinese Green Radish and Carrot Pork Bone Soup, Thai Coconut Soup and Pasta e cesi and Brazilian Moqueca de Camero. We've got lots of vegan soup options and lots of twist on old classics. There is a homemade soup for everyone here so enjoy! 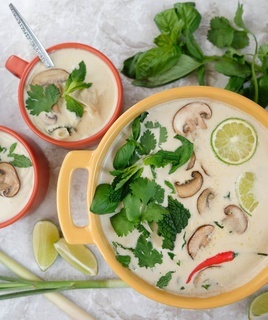 **[Vegan Thai Coconut Soup](https://www.slicedginger.com/home/thai-coconut-soup)** from **Sliced Ginger**. There is just something so comforting about a Thai Coconut soup. Maybe it's the creaminess of the coconut milk or the bright citrus and cilantro flavours but it never fails to satisfy! **[Roasted Butternut Squash Soup](http://mamasecretrecipes.ca/roasted-butternut-squash-soup/)** from **Mama's Secret Recipes **is a quintessential winter soup that makes the most of the sweet, filling flavour of seasonal butternut squash combined with a hearty chicken stock and luxurious whipped cream. A winter classic! Whether you're eastern European or not, most of us are familiar with a classic beet borscht. But have you ever tried Zurek? It's a** [Polish White Borscht](https://cultureatz.com/polish-white-borscht-soup-recipe/)** and this version is from **CulturEatz. **It's made with a fermented sour starter much like sourdough bread and filled with a potatoes and optionally, sausage and/or eggs! **[Moqueca de Camara - Brazilian Shrimp Soup](https://www.baconismagic.ca/brazil/brazilian-shrimp-soup/)** from **Bacon Is Magic** is a dish that's common in norther Brazil in the fall and winter with each village having it's own version. It's similar to a North American shower and you can make this version at home from start to finish in just 20 minutes! **[Creamy Chicken Sopas](https://theunlikelybaker.com/creamy-chicken-sopas-filipino-chicken-noodle-soup/)** from **The Unlikely Baker **is the Filipino version of chicken noodle soup (Sopas in Tagalog). It uses evaporated milk for it's creamy texture and like most chicken noodle soups it's full of easy to find ingredients. Comfort food at its finest. Tortilla soup is a favourite in my kitchen but who would have thought you could make it in 10 minutes without turning on your stove? ** [Tortilla Blender Soup](https://www.blenderhappy.com/tortilla-blender-soup/)** from **Blender Happy** does just that - but you'll need a Vitamix to make it happen. Might just be worth it to get one! **[Vegan Curried Instant Pot Split Pea Soup](https://delightfuladventures.com/curried-instant-pot-split-pea-soup/)** from **Delightful Adventures** is a twist on a classic soup recipe. And she has directions for both the Instant Pot and stove top! **[Creamy Chicken Soup With Egg Noodles](https://deliciousonadime.com/creamy-chicken-soup-egg-noodles/)** from **Delicious on a Dime** is an easy comfort food soup that's simple to make and full of pantry and freezer staples. A great weeknight option when you crave a bowl of homemade chicken soup. **[Moroccan Carrot Soup With Chermoula](http://immigrantstable.com/2015/11/03/moroccan-carrot-soup-with-chermoula/)** from **At The Immigrant's Table** is a warming carrot soup that's flavoured with chermoula - a blend of garlic and cilantro with additional spices. [**Pasta e ces**i ](https://pinabresciani.com/pasta-e-ceci//) is a traditional roman soup of pasta and chickpeas in either a chicken or vegetable broth. This version comes from **Pina Bresciano** and it's so good her mom's handyman insists on getting paid with it! Now that's a good bowl of soup! This** [Vegan Coconut Curry Lentil Soup](https://melissatorio.com/vegan-coconut-curry-lentil-soup/)** from **Melissa Torio** is a wonderful option for plant based diets. The lentils make it hearty and satisfying with all that coconut curry flavour. This** [Rustic Potato and Sausage Soup](https://www.compelledtocook.com/rustic-potato-and-sausage-soup/)** from **Compelled To Cook** is full of chunky vegetables, sausage, potatoes and lots of kale cooked in a tomato laced chicken broth that's sure to satisfy. RELATED: FBC Pasta Week: 8 Shapely Noodle Recipes - Ooo La La!